was a delight. 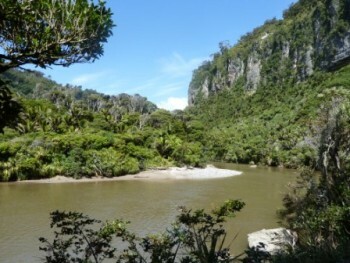 This country is soooo clean, green, unpolluted, eco-friendly and uncrowded. No wonder they are really strict at Immigration. Too many people would never leave. and up the side of mountains. 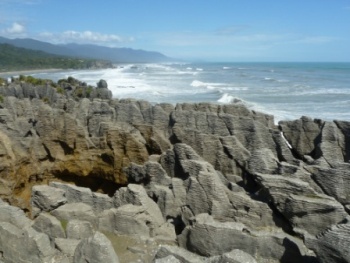 All along the trail the views are "brilliant" as they say in New Zealand. 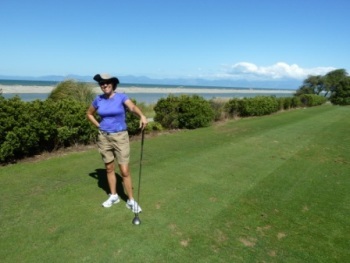 The 18-hole Motueka Golf Club was a lot of fun. 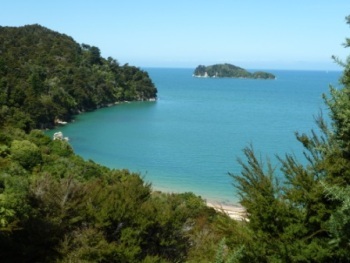 It runs along the Tasman Bay and you always have a view of either the bay or the mountains. 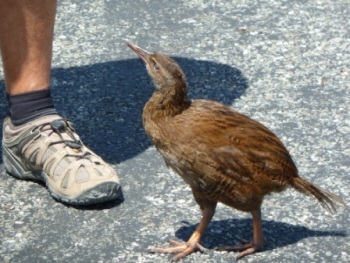 Weka birds are all over the west coast of the South Island. This one was begging Paul for food. 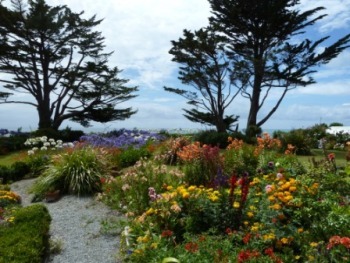 Steeples Cottage in Cape Foulwind was fantastic. 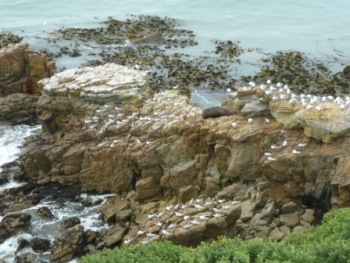 the lighthouse and sea lion colony. 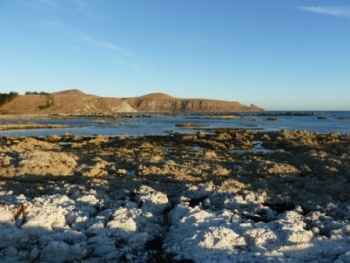 Buller area of the Northwest Coast! 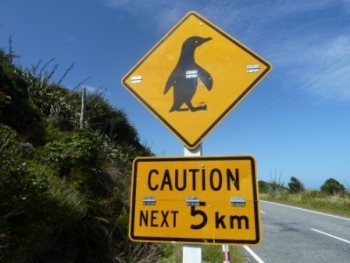 As we drove south toward Punakaiki, we started watching out for Blue Penguins crossing the road. 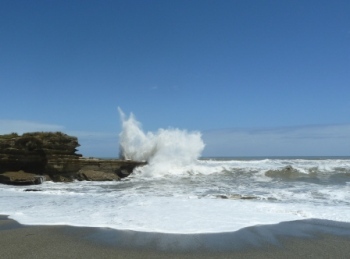 and its blowholes. 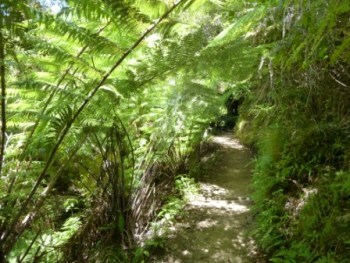 The Pororari River Track is really deserted. We saw very few people the whole time we walked. it was steaming in the warm air. 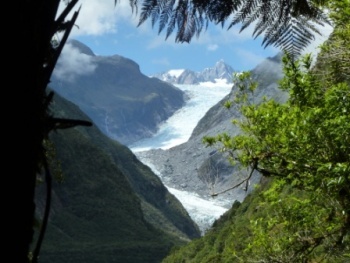 This is the Franz Josef Glacier. 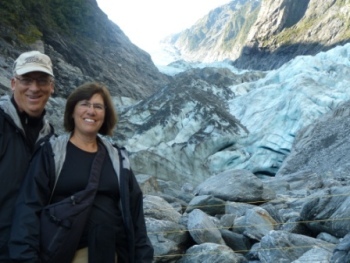 One of the only glaciers still growing. 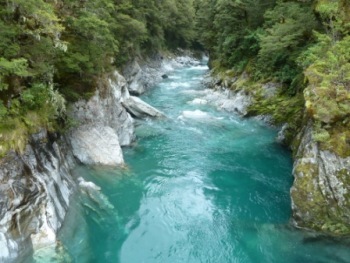 Nearby Fox Glacier showed the same blue ice in a rainforest setting. 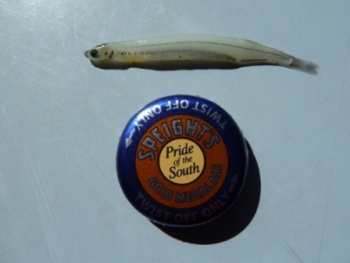 that collected in pools and trout streams. 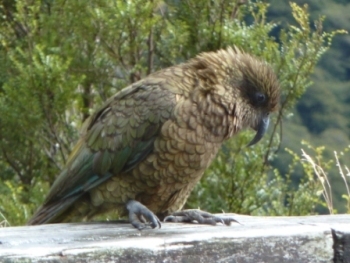 The Kea is the world's only alpine parrot. It is about a foot long from head to tail. 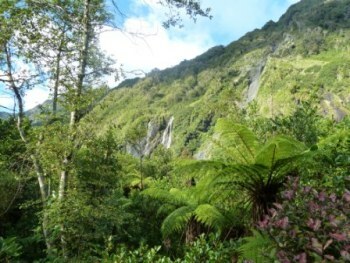 This is the beautiful Milford Sound. 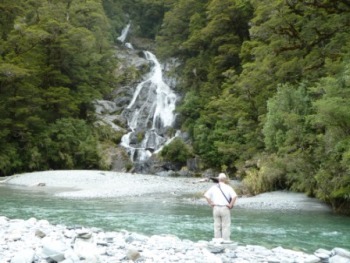 We stayed in a chalet at the Milford Sound Lodge and counted 17 waterfalls from our window. 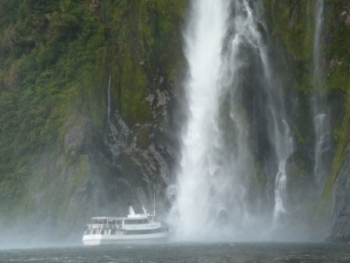 People on the observation deck ran inside as we went under the 151 meter Stirling Falls on our small boat cruise through Milford Sound. 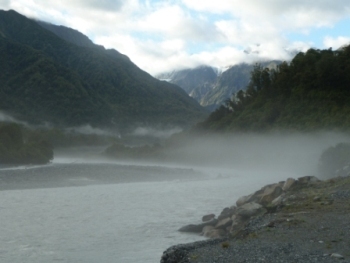 The steep walls of the fiord were cut by glaciers over 17,000 years ago. 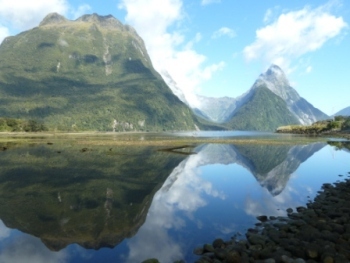 Snowy Mitre Peak in the backgound was reflected in the mirror-like water. 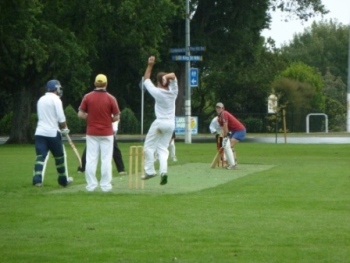 In Dunedin, we saw cricket being played in the park. 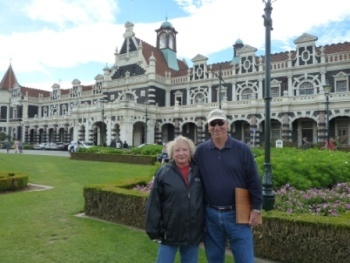 Our friend, Mary and Paul enjoyed the park in front of the Dunedin train station. Paul is holding a cutting board made of wood from an old Invercargill prison cell floor. 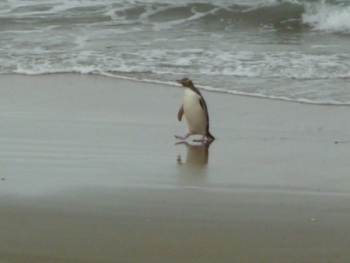 We were thrilled to see a rare Yellow-eyed penguin coming ashore on the Otago Peninsula. 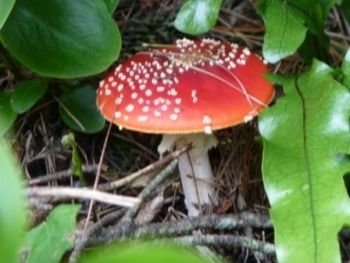 of the strange plants found here. 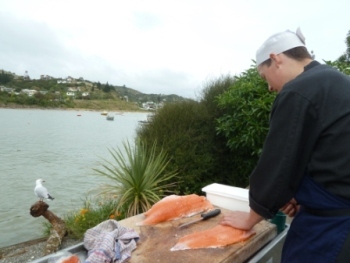 Fleur's Place in Moeraki serves super-fresh fish. some salmon filets oceanside. 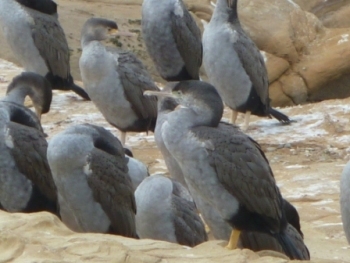 Shag Point on the Atlantic coast . 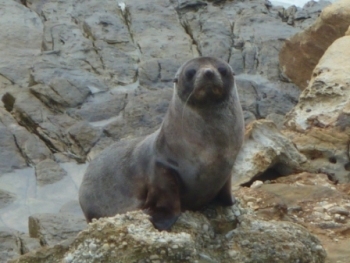 . .
was full of seabirds, seals and sealions like these. 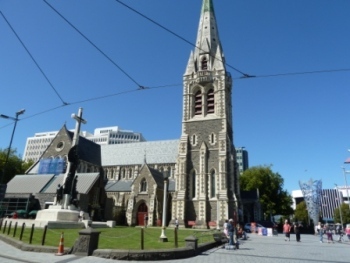 Strangely, New Zealand has very few native wild animals. 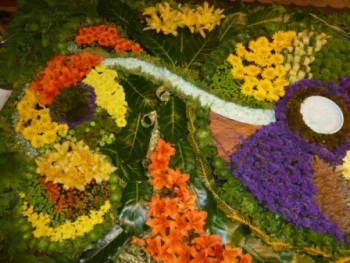 Most creatures here are birds and reptiles. There are no poisonous snakes or dangerous animals. 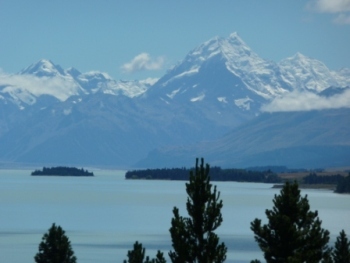 facing Mount Cook and the Southern Alps. 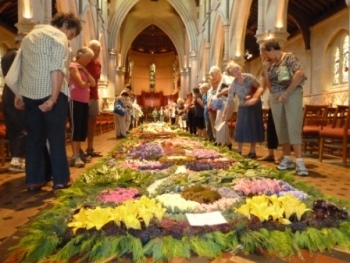 The center aisle of the Christchurch Cathedral featured a carpet of flowers, fruit, seeds, leaves, herbs, plants and vegetables all combined in a mosaic pattern as part of the annual Festival of Flowers. 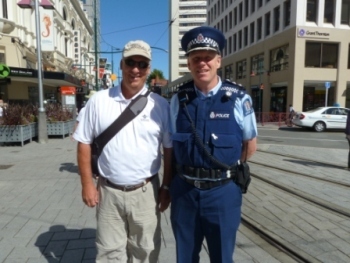 NZ cops don't carry guns. We stopped by the Pegasus Golf Club where the NZ Women's Open is being played. 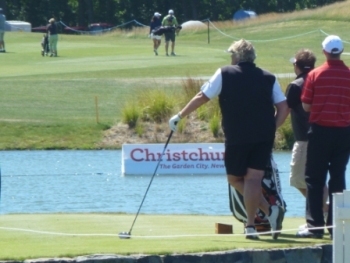 Defending champion, Laura Davies, was standing on the tee box during the practice round. 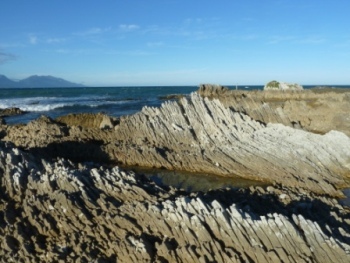 The drama of ocean waves is captured in natural rock formations along Kaikoura's coast. 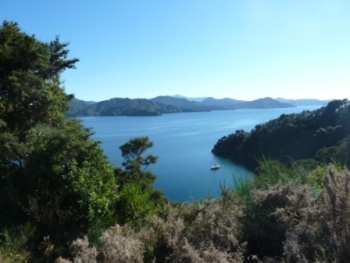 This was the sweeping view from our Absolute Waterfront apartment patio. spent 4 days enjoying the isolation of the cove. 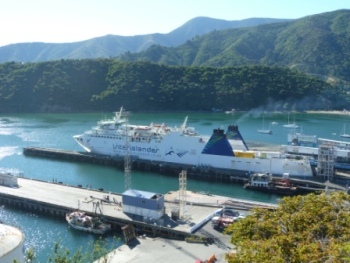 On an 80° and sunny February day, we returned to the North Island with our car on the Interislander ferry. 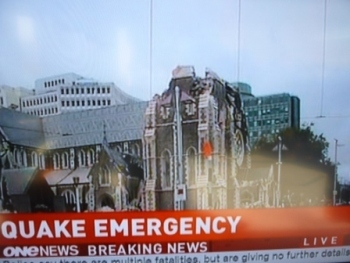 6.3 earthquake, as shown on the news. 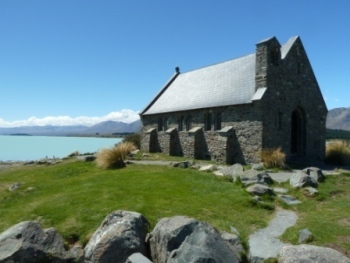 On a lighter note, we are in Napier on the North Island and saw this church in the middle of a vineyard. 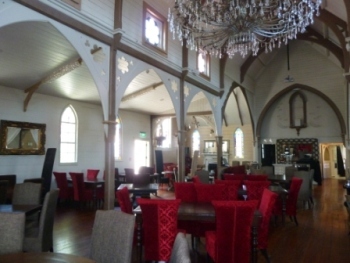 It was The Old Church Bar and Restaurant. We went to an Australian themed night they were presenting. 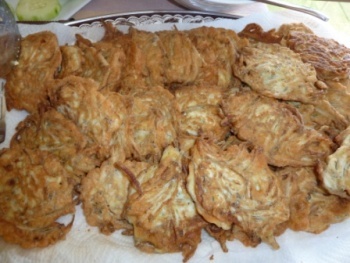 The five-course meal included ostrich, kangaroo and wild boar ribs. 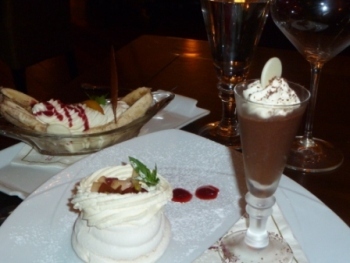 It was all topped off with Pavolova roulade, dark chocolate mousse and BBQ bananas. 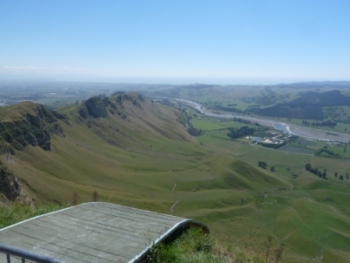 Just outside of Napier the Te Mata mountain had a ramp that people used to jump off for hang-glidling. No, not us! 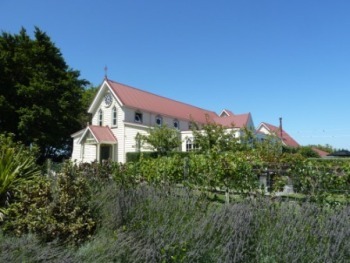 Steeples Cottage, owners, Pauline & Bruce Cargill - www.steeplescottage.co.nz -The owners are so friendly, you immediately feel like you've known them for years and are part of the family. 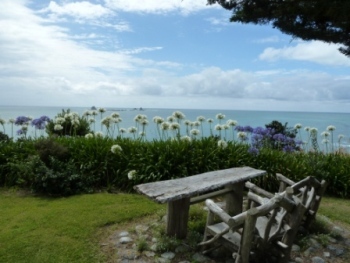 Outstanding, large freestanding cottage with all the extas and killer view of the Tasman Sea. 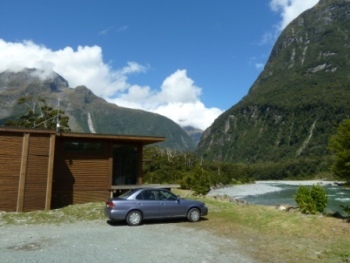 Milford Sound Lodge - www.milfordlodge.com - You don't need to leave your chalet to enjoy being here in any weather. 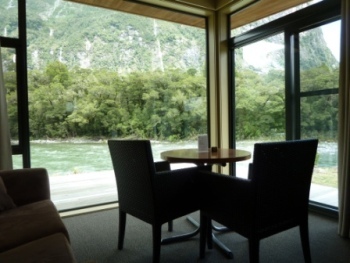 Ask for Chalet C4 for a private, unimpeded view of the Cleddau river & mountains. 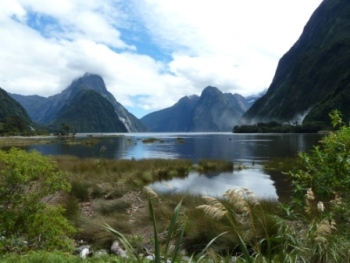 Which Milford Sound cruise? 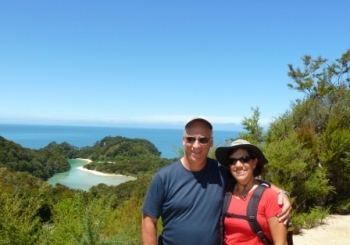 We really liked the Mitre Peak cruise. The small boat (capacity 75 passengers) got right next to the water's edge, where the larger ships couldn't go. 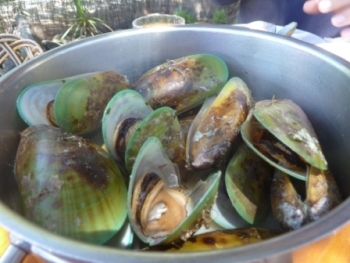 Naturalist/captain told us about the history, flora & fauna of the area.